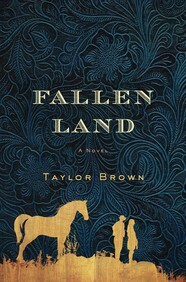 W​e’ve come out of our candy comas​,​ shaken off the cobwebs​, and are ready​ to tell you about ​our favorite Winter 201​6 debut​: FALLEN LAND by Taylor Brown. You can read an excerpt of FALLEN LAND in the St. Martin’s First Winter 2016 e-sampler. FALLEN LAND will be available from St. Martin’s Press on January 12, 2016.